Whether a light duty 2 floor application, or an intensive traffic high rise interconnected bank of lifts in a busy office, LS Lifts Limited have a range of pre-engineered and bespoke applications to provide vertical transport in all types of building and environments. 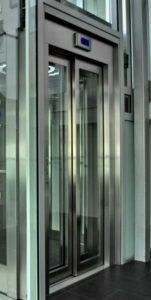 With load capacities from 2 persons to more than 40 persons serving 2-40 floors and lift speeds of 0.5 m/s-2.5 m/s, LS Lifts Limited offer an extensive range of power systems, control systems and door configurations to ensure that we have a value for money, solution with optimum passenger handling capabilities for the most demanding of environments. Just as important as the technical and performance criteria of a lift installation are the aesthetics; after all the landing entrances and lift car interior are what all users see. An extensive range of metal, laminate, wood, and glass finishes used in conjunction with pre-engineered or bespoke designs ensure that as well as offering reliable lift service the installation will enhance the aesthetics of the most demanding of buildings.